This Princess Aurora fan art contains anime, grappig boek, manga, cartoon, and stripboek. Cinderella was treated horribly by her stepmother and sisters, she lived through a life of despair all while remaining hopeful and happy, that is not weak, most people could not endure a life like that. Snow White was almost poisoned and killed by her stepmother who also treated her as a slave her entire life, she got away and managed to carry on in a life that she knew nothing about, how many people do you know that would leave their entire life behind and make a new one for themselves in a situation that is not ideal. 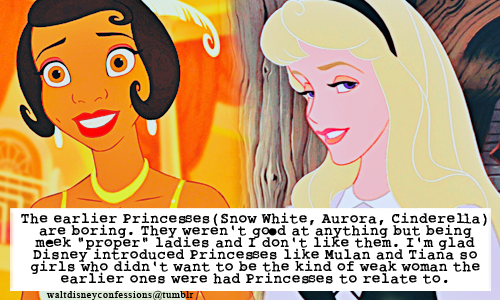 Yes, Tiana is verbally tough, she also endured a hard life but Tiana grew up with two parents (until her dad died) that loved her, she was made to be tough, same with Mulan. These women are all strong in different ways, just because you judge harshly doesn't make you tough, it actually makes you the weaker link.